Fritz Golman, Television Director at Chicago’s Museum of Broadcast Communications, and I are playing a game of “Name That Object.” Golman describes one of the hundreds of objects on permanent display at the museum that tell the story of American broadcasting, and I try to find it. The object is housed inside a Plexiglas enclosure on the museum’s second floor, a floor devoted exclusively to the history of radio, and is wearing a top hat and tails. During the 1930’s, 40’s, and 50’s, Charlie McCarthy was America’s favorite ventriloquist dummy. Weekly radio audiences convulsed in laughter at McCarthy’s quick wit and caustic put-downs, earning his mouthpiece, Edgar Bergen, a place in the National Radio Hall of Fame, housed inside the museum along with hundreds of other artifacts, like vintage receivers, props, and other reminders of radio’s golden age. Fritz Golman at the National Radio Hall of Fame exhibit in the Museum of Broadcast Communications in Chicago. Edgar Bergen’s “dummies” including Charlie McCarthy are displayed in the background. 190 men and women are currently enshrined in the National Radio Hall of Fame on the museum’s second floor. The list of inductees reads like a veritable who’s who of radio history, including such notables as Jack Benny, Bing Crosby, Howard Stern, Paul Harvey, Bob Hope, Casey Kasem, Garrison Keillor, Larry King, U.S. presidents FDR and Ronald Reagan, Orson Welles, and Wolfman Jack, to name just a few. Every November, the radio world turns out for the annual induction ceremony, currently being held in the museum’s 4th floor auditorium. The ceremony is a perennially sold-out, star-studded evening, saluting the latest class of inductees. This one is hard to miss. 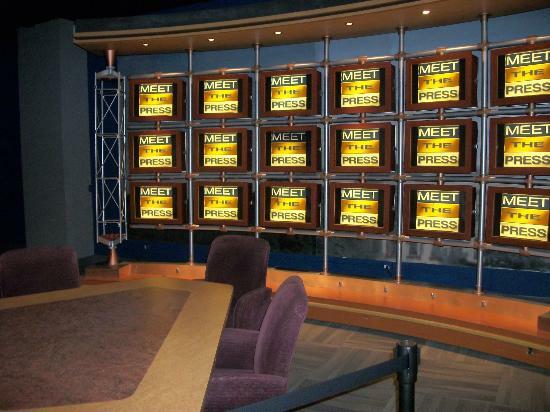 The former set of the NBC show “Meet the Press,” the longest-running program in the history of American broadcast television, occupies a prominent nook in the museum’s television wing. The iconic set features a prominently displayed NBC logo on the front of its walnut desk, and a back wall with the program’s name repeated in eighteen monitor-shaped graphic panels. There’s nothing at all “virtual” about this classic set. 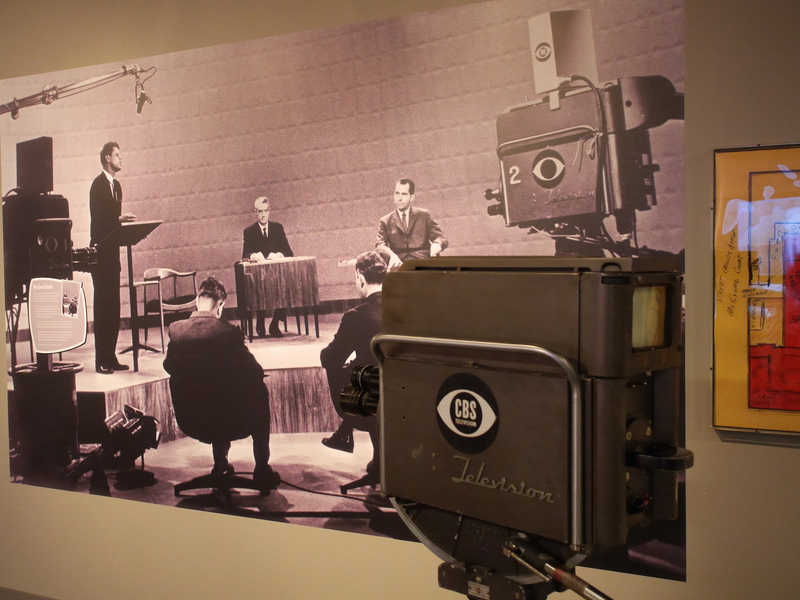 Directly adjacent to the “Meet the Press” set is one of the museum’s most prized pieces, President John F. Kennedy’s close-up camera from the first 1960 presidential debate, which was held in Chicago. Many historians credit this nationally televised debate with securing Kennedy a victory at the polls over his Republican rival, Richard Nixon. The debate clearly established the television medium’s power to sway voters and changed America’s political landscape forever. 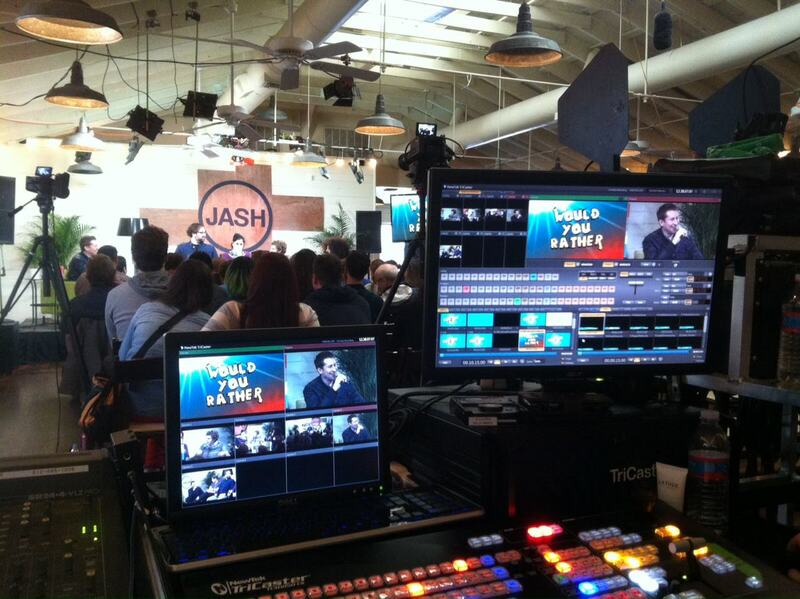 Golman is talking about the museum’s new TriCaster 8000, a tool that’s at the heart of everything the museum does. TriCaster is used for a variety of purposes inside the museum. Every Sunday afternoon, the device is used to produce a political talk show called “Beyond the Beltway” that airs on Chicago’s PBS station, as well as on radio. During the hours the museum is open, the TriCaster allows visitors to get first-hand knowledge of what it’s like to be a broadcaster, as they take on the role of newscaster. Thanks to scripts, graphics, and production elements provided by WLS-TV, the local ABC owned-and-operated station, museum guests can take a seat at the anchor desk and become news anchormen or women, if only for a few moments, with the TriCaster adding all the production bells and whistles. Klauke loads a one-inch tape machine, and I notice that the TriCaster is ringed by vintage videotape players. The collection spans several decades of television history, and as I watch tape spool through this video dinosaur, I wonder if I’m the only person struck by the irony in the situation; a bank of “video antiques” is connected to one of the newest and most versatile digital video tools available. It’s a line of questioning I decide to save for Ronald McDonald and Charlie McCarthy, both of whom, it turns out, are unavailable for comment. The first class of inductees into the National Radio Hall of Fame, inducted in 1988, included Alan Freed, the Cleveland DJ who coined the term “Rock N’ Roll,” CBS President William Paley, Groucho Marx, Orson Welles, investigative journalist, Edgar R. Murrow, and the man who invented radio, Guglielmo Marconi. The section of the Chicago museum that draws the most comments from museum visitors is a section devoted to the local children’s television program “Bozo’s Circus,” featuring costumes and props from the show. The program, which actually went under three different titles during its long run on Chicago’s WGN-TV, aired for over 40 years. “Fibber McGee and Molly,” one of the programs enshrined in the National Radio Hall of Fame, featured a running gag where the title character would open a door to his closet and become buried in the seemingly endless supply of junk spilling out onto the floor. McGee’s closet is recreated as a hands-on display on the museum’s second floor, complete with an accompanying audio clip from the program.